This chapter describes how the benchmarking procedure was applied on three groups at different levels of scale: organizational, community, and sectoral. It presents the climate change responsiveness profiles of three sectors: the academe, the youth, and a national government agency, the Department of Agriculture. Climate change responsiveness is defined as a determinant of resilience, along with risks and resources. Responsiveness has three elements: the amount of knowledge gain (?K); the degree of attitude change (?A); and the change in action or practice (?P). Climate change responsiveness (CCRp) profiling used a scorecard with a five-point scale: 1 as very low, 2 as low, 3 as moderate, 4 as high, and 5 as very high. Data gathering was conducted online through the Survey Monkey. Responses from almost 300 respondents resulted in the following scores: Department of Agriculture - 3.93 (high); the academe - 2.8 (moderate), and the youth sector - 2.59 (moderate). The following case study provides us with an example on how climate change adaptation benchmarking is done. It was conducted in the third quarter of 2015. 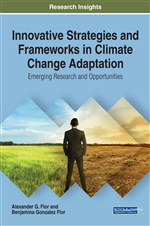 The research featured in this chapter is a multisectoral assessment of climate change responsiveness. However, it employed the one-shot survey method only sans focus group discussions and key informant interviews because of the differing scale of the respondent groups.